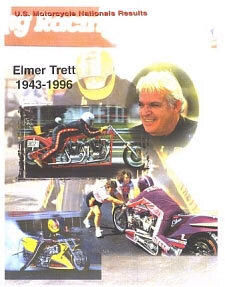 On September 1, 1996 motorcycle drag racing lost perhaps the greatest Top Fuel rider in the sport’s history when Elmer Trett came off his motorcycle at the top end of Indianapolis Raceway Park. 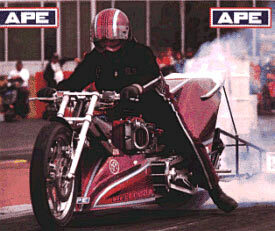 Trett was a trendsetting genius in the world of drag bike racing. 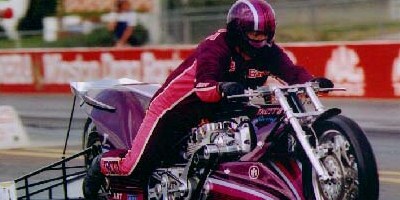 During Trett’s career, his incredible home-built dragbikes reset, often shattering, the world elapsed-time and speed records over 15 times, including the legendary, long-standing record blast of 6.06 at the 1996 Prostar Pingel Thunder Nationals. Trett was the first man over 200, 210, 220, and 230 mph. For his influence and impact on the sport the NHRA recognized Trett as number-50 on its list of the greatest 50 drivers of all time – highly impressive considering the NHRA is an organization showcasing primarily four-wheeled vehicles. I was lucky enough to have been a part of racing when Elmer was still with us. We met in Gainesville – Jim Fox introduced me to him. Later we saw each other again in Bradenton with Jim Head. To see Elmer, Jim Fox & Jim Head compare notes and give each other ideas was amazing!! If there was a man that could race forever and had a name that meant to everybody that knew him The only thing that came to mind. Elmer Trett. Would be on the top of the list. elmer was my hero& still is today. i was 13 yrs old when i first got toc him race. Was at the track on that fateful day 9/1/96. I will never forget the tragedy. I learned something that weekend with Elmer’s and Blaine Johnson’s deaths on how bonded and close knit the racing community is. I was there that weekend. I watched Elmer die. I was in my camper when Blaine was killed. Horrible weekend. I’m pretty sure there wasn’t a dry eye there during the opening of the final elims. I was at that race in Cincinati that Tery spoke of and remember him doing that. He was trying to talk to Owens about timing the 2 engines in the double to maximize torque or go for evening out the pulses and Owens said I just put the engines in the frame and and hook em up where they are with no regard for what your talking about. Elmer showed no emotion and just shined it on. I wil never forget that. Which is in use today…He would take time to talk with you.Unlike many of the famous guys today..God speed my friend…. I was privileged to chat with Elmer in the Pits, and visit with for a short time at the U.S. Nationals at Indianapolis, shortly before he was killed. He was very nice, considerate, even to just a fan that knew nothing about what made his Bike go so fast. It was a very black day as I watched him make his last run, then remembered his kindness to me. I have not forgotten that time, but saddens me even today when I recall his death. RIP Elmer. Elmer gave a demonstration run at Long Marston Raceway in England (early 80’s), so I rode down with my Nephew on my bike to see him and 30+ yrs. later still stands out as one of the highlights of my motorcycling career. He was there with his Missus and such a nice family and he made it all look so easy when he took off down that strip. Only shed tears twice when hearing upon a riders demise———-S.M.B. Hailwood and Elmer Trett.